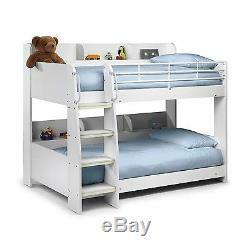 Modern Kids White Wooden Julian Bowen Domino Bunk Bed + Storage Shelves. Compact space saving design with built in shelving. Neutral design suits both boys and girls bedrooms. Strong wood combination construction with a fresh white finish. Both bunks support a maximum weight of 15 stone. Guard rail and handles for top bunk safety. Ladder features glow in the dark strips for clear visibility. Fixed ladder, cannot be re-positioned. Bunks cannot be split into single beds. Slatted bed basses for comfortable mattress support. Both bunks fit Standard UK single mattresses 3ft/90x190cm. Check out our mattress recommendations below! Whether you have a box room or simply want to free up some space for play time the Domino Bunk bed is a great choice with it's compact, space saving design. The bunks feature built-in shelving, eliminating the need for bedside tables. With all essentials being able to be stored within easy reach there's no need for your children to be leaning and reaching out of bed. Finished in fresh bright white with cute curved corners the design coordinates easily within boys and girls bedrooms. Supporting a maximum weight of 15 stone the bunks can easily be used until your children are ready to upgrade to their first adult beds. The Domino has safety in mind with a top bunk safety rail, supportive ladder handles and chunky easier to climb steps which feature glow in the dark strips for night time visibility. Making the Domino a great choice for younger children. LASTING THE TEST OF PLAYTIME. The Domino Bunk Bed has been made in the UK with a tough wood combination construction and an easy clean white foil finish. Both bunks have wooden slatted bed bases offering comfortable mattress support. These bunk beds will be delivered flat packed and self-assembly will be required. We would recommend two people for assembly as this is a larger item. Assembly shouldn't take too long as the instructions are clear step by steps, take a look for yourself. OVERALL DIMENSIONS: H161 x W116-137 x D199 cm. Under Bed Height: 7cm Weight: 109 kg Maximum Mattress Depth: 19 cm. Both bunk beds fit standard UK single mattresses (3ft/90x190cm). Due to safety regulations it is advised not to exceed a mattress depth of 19cm. Mattresses are not included with the bunk bed. 601 customers have bought and rated this product, giving it an average score of. Our success has been achieved though purchasing at highly competitive prices and passing the savings directly on to the customer. Our aim is to provide customers with something many of our competitors fail to achieve: competitive pricing and a top-class service. Nearly all orders arrive on time and in good condition but occasionally goods can get lost or damaged in transit, we do our best to prevent this by working the the highest quality couriers available however if you have a problem please call our team on 01484 319 812. You may also be interested in.. The item "Modern Kids White Wooden Julian Bowen Domino Bunk Bed + Storage Shelves" is in sale since Wednesday, August 26, 2015. This item is in the category "Home, Furniture & DIY\Children's Home & Furniture\Furniture\Bedframes & Divan Bases". The seller is "buyitdirectdiscounts" and is located in Huddersfield, West Yorkshire. This item can be shipped to United Kingdom.